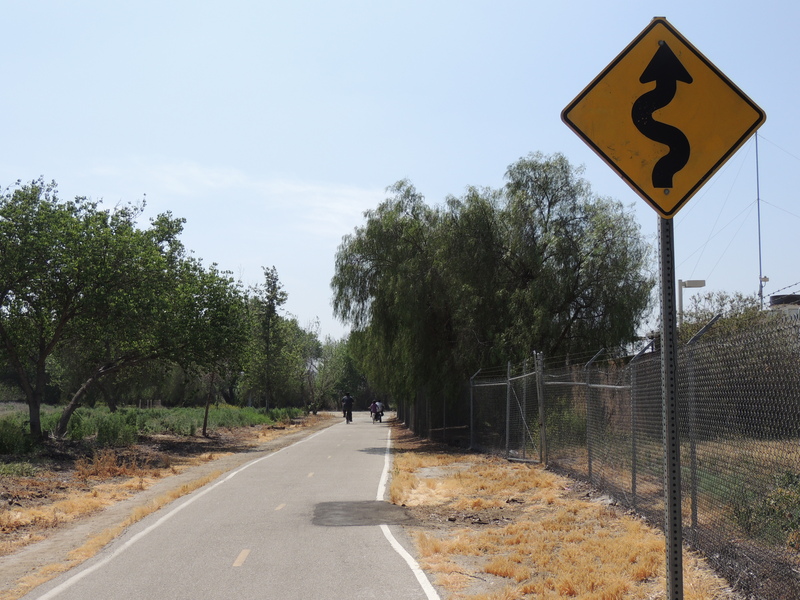 The Santa Ana River Trail was called the “longest and best” off-road cycling path in the Los Angeles area by LABikePaths.com. It winds for 40 miles along the Santa Ana River from Green River Canyon, where the river emerges from the San Bernardino Mountains to the ocean, between Huntington Beach and Costa Mesa. 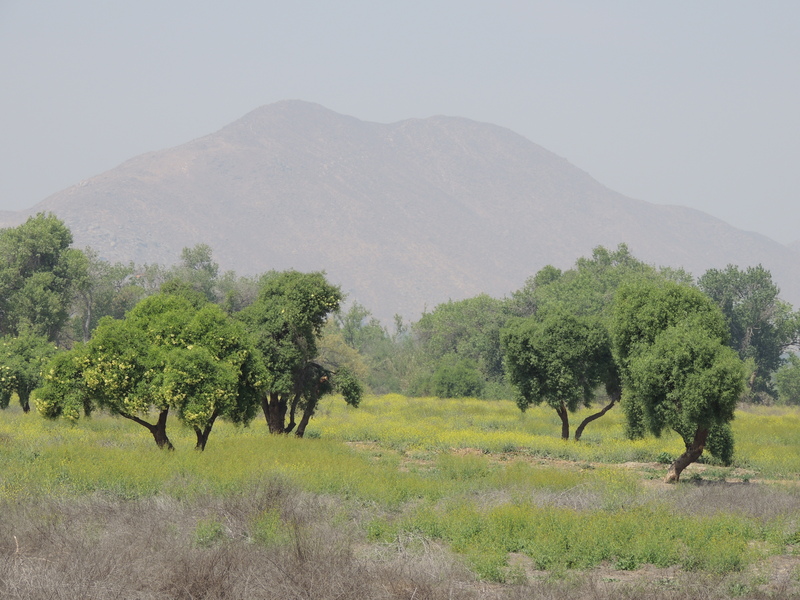 The Santa Ana River is the backbone of the Santa Ana Watershed, which encompasses much of the Inland Empire and Orange County and provides water to millions of people. 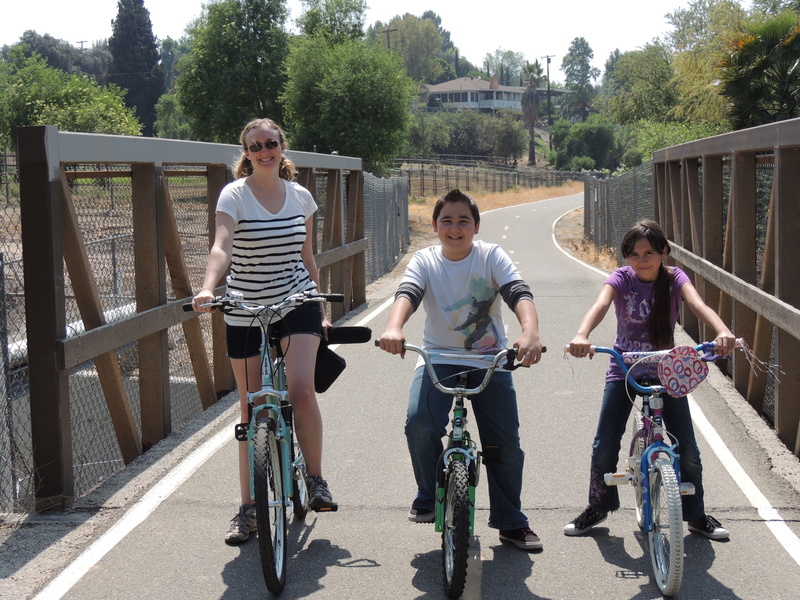 Hunter, Emily, and I pose for a picture on a bridge over a stream leading to the Santa Ana River (helmets are off for all stationary shots). There are plenty of stretches of bike path to explore. We chose Riverside because there is a very long section with natural areas adjoining it. To learn more about the trail, how it came to be, and different access points, visit the Santa Ana River Trail’s website. The bike trail follows the Santa Ana River. Emily, Hunter, and I started our adventure in Riverside (named because the city sits next to the Santa Ana River), at the Carlson Bark Park, which is one of the easiest access points to the river trail in the area. It is a delightful dog park with plenty of parking at the foot of Mt. Rubidoux. We cycled south, toward the ocean. The river itself is not easily spotted along this stretch. Instead, it feels more like we were biking next to a strip of grassland with plenty of beautiful, old trees. The area in the riverbed is lush and green. 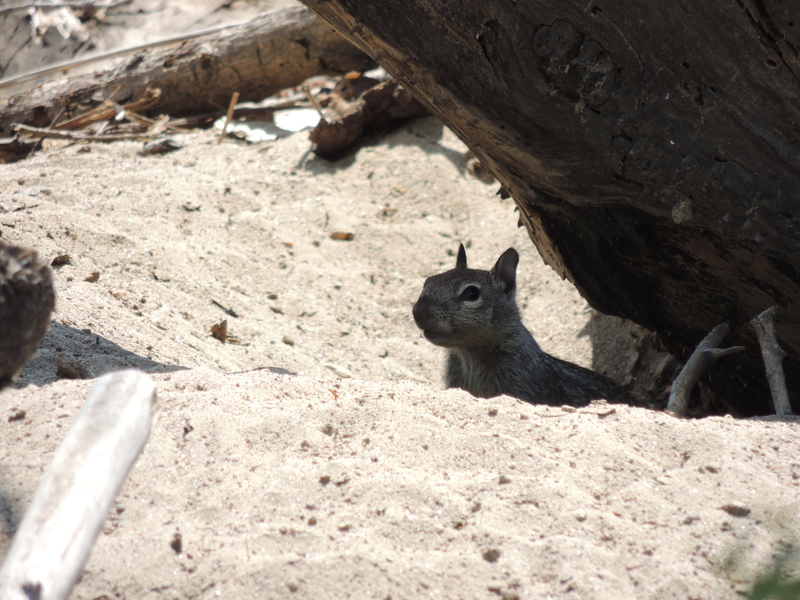 Riverside itself is fairly dry, but the stretch near the river is a lush green landscape full of wildlife – chipmunks, squirrels, ducks, and other birds. The kids loved pulling over to see if they could spot animals in the grassland and wooded areas. We saw a couple of chipmunks and a pair of Mallard ducks in one of the small tributaries into the river. One thing that I learned on this outing is that kids don’t really need a lot of expensive stuff. They just want to go on an adventure and were both really excited to explore nature. 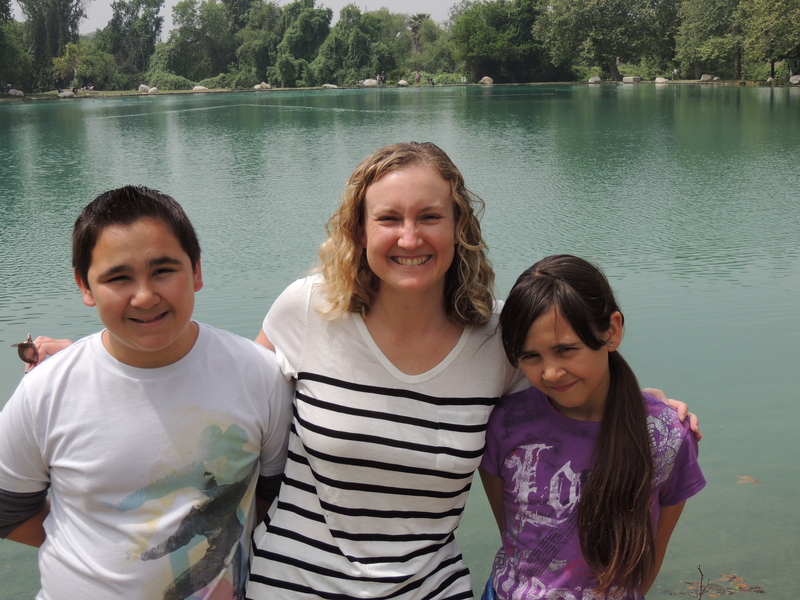 This trip is a great way to bond with kids while keeping an eye on your pocketbook. Emily and Hunter were excited to spot plenty of wildlife. Mt. Rubidoux is an excellent landmark on the way back. It is a granite hill that was named after wealthy landowner Louis Rubidoux and was developed in 1906 by Frank Miller, owner of the Mission Inn. At the top is an American flag and a cross dedicated to Father Serra (incidentally, the riverbed is awash with mustard plants attributed to Father Serra’s travels between missions as the Spanish settled California – making for an excellent chance to teach kids about California history). Roads leading up to the summit of Mt. Rubidoux were originally meant for cars, but the mountain was closed to vehicles in 1992 and now is a great place for hiking and biking with a view. There are many options for lunch in the area, but nothing beats a picnic in a park. 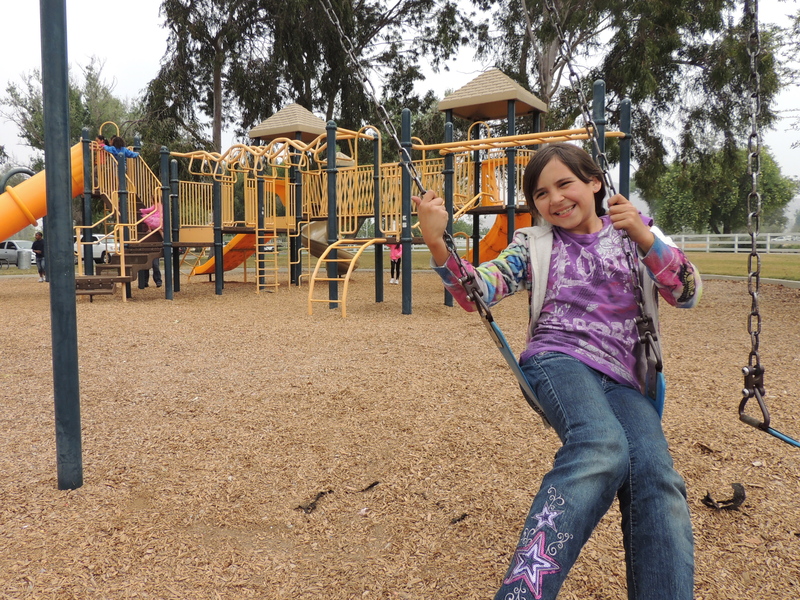 Rancho Jurupa Park is great for a picnic and a chance to rest while the kids play. Rancho Jurupa Park, just on the other side of the river from Carlson Bark Park, is an excellent choice. They do have a nominal charge for admission, but the park is packed full of amenities (such as bathrooms, barbeque pits, picnic tables, and playgrounds). If you and the kids need to cool off after a hot ride, there is a mini water park right next to the visitor’s center. The visitor’s center conveniently sells ice cream, snack foods, cold drinks…and fish bait! Also, if you still need to run off more energy, there is miniature golf and Frisbee golf for the family to enjoy. Carlson Park is near where the 60 Freeway meets the 91 Freeway. It is on Mission Inn Avenue and Scout Lane (which is really just the parking lot).